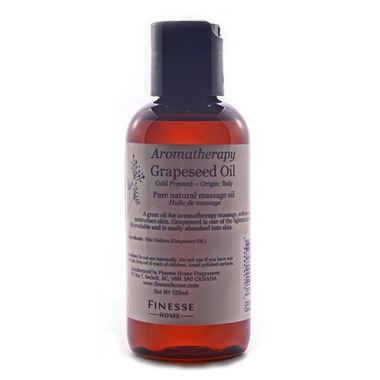 Grapeseed Massage Oil is a highly prized carrier oil in aromatherapy and massage therapy. It has almost no aroma and is wonderfully light in texture. It is a great non-greasy oil that is easily absorbed by the skin. It is mildly astringent, which helps to tighten and tone the skin. This makes it useful for acne and other skin complaints when having a cleansing massage. Grapeseed oil is rich in linoleic acid, an essential fatty acid for the skin and the cell membranes. Grapeseed oil has regenerative and restructuring properties and has excellent skin moisturizing properties. It contains vitamins, minerals, and protein, GLA, and a small amount of vitamin E. It penetrates the skin easily bringing it moisturizing, regenerating and protecting effects.